The Maruti Suzuki stock has shed about 12 per cent from its all-time intra-day high of Rs 10,000, recorded in mid-December 2017. That is due to the correction in broader markets and softer demand expectation for the industry, especially in the urban segment. Although demand for Maruti's key models remains strong, some analysts also point to the possibility of capacity constraints for the company in 2018-19. While the competition environment for the company is benign for now, rising commodity prices and entry of new players are issues. Having said that, analysts also say many of these are temporary and long-term investors could utilise the current situation to accumulate the stock on declines. A worry now is slowing demand in the top 10 cities, which account for 40 per cent of overall industry volume -- sales growth here has been flat over the past year. Analysts believe the rise in ride sharing (Uber/Ola) has led to lower private car demand. Aggravated by softer demand from cab-sharing companies as well. Further, poor road infrastructure and traffic congestion in cities, along with improvement in public transportation infrastructure, have added to the slowdown. Now, with interest rates and oil prices inching up, it would mean higher ownership and operational costs for the customer. Analysts at HSBC say the sluggish demand could be due to cyclical issues -- slower economic growth, impact of the goods and services tax (GST) and slower white-collar employment figures. The outlook for FY19, though, isn't exciting. In a note this month, India Ratings and Research (Ind-Ra) maintained a stable outlook on the automobile sector for FY19; it expects moderate sales volume growth in the passenger vehicle (PV) segment. Amid weak demand in the top markets, the brokerages expect the automobile sector to post a little over eight per cent growth in FY19, led by rural demand, government employees (pay commission implementation by states) and better job growth. 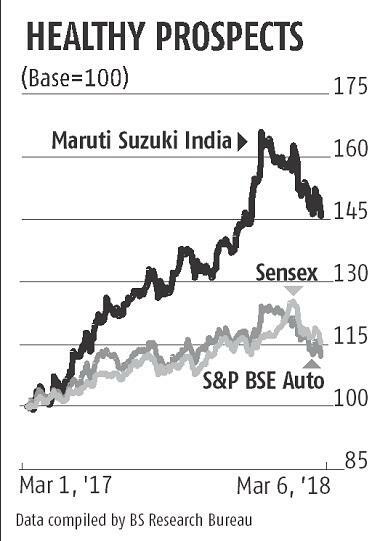 However, within that, they expect Maruti will continue to outperform. While sales of the rest of the industry have fallen 10 per cent in the top markets, Maruti continues to outperform, with growth of seven per cent. Also in favour of Maruti is the faster growth in rural markets, 36 per cent of overall volumes. 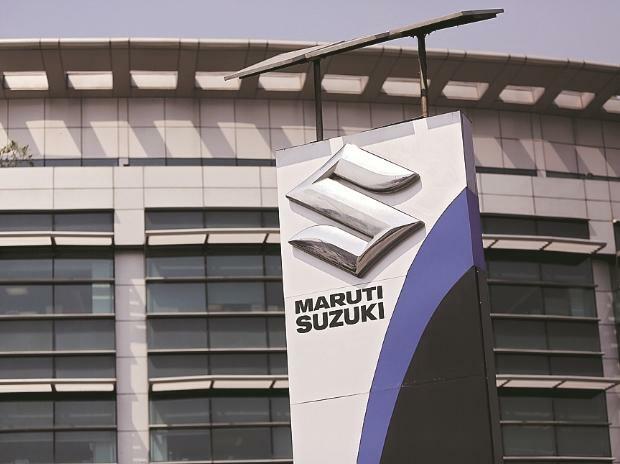 Most brokerages expect Maruti to hit the double-digit volume rise mark in FY19, gaining further over the competition. Its market share is up from the 47.4 per cent of FY17 to over 50 per cent currently, on the back of successful new models such as the Baleno, Brezza, Dzire and now the new Swift. The order book is 40,000 for the new Swift; the waiting period for other new successful models is four to 12 weeks. Capacity could be a hurdle. However, Maruti is ramping up the capacity from the current 1.8 million units a year, of which the new plant (Sanand, Gujarat) contributes about 250,000. Its 2017-18 output is pegged at 1.79-1.8 mn by analysts. The second phase of expansion will help add another 250,000 units in capacity but in January 2019. While the company is yet to take a decision on further additions (third phase), total capacity possible at the new plant is 1.5 mn units. While there are pressures on its margins, given the rising input costs, the company is wary of taking any price hikes, say analysts. However, in addition to cost rationalisation, it could also benefit from operating leverage, given the steady demand, vendor localisation in Gujarat and lower royalty payments to Suzuki, the Japanese parent. These factors, say analysts at IIFL, should offset the pressure due to rise in input costs. Among key monitorables will be pace of demand recovery and appreciation of the Japanese currency, which could have an operational and financial impact. Further, with Kia, SAIC and Peugeot planning to set up operations in India, competitive intensity would increase by 2019-20. Despite slowing demand in key markets, rising competition and cost pressure, brokerages expect Maruti to outperform the competition, given its strong portfolio, reach and operating leverage. In addition to rural and public sector employee demand, they expect a gradual pick-up in demand from small and medium enterprises, the self-employed and white-collar employees as the impact of GST normalises. Thus, they continue to be positive on the stock. At the current price, it is trading at 27 times its FY19 earnings estimate.